Maybe 15 years ago I read William Gibson’s Neuromancer and hated it. At some point after that my brain started confusing Gibson with Neal Stephenson, with the result that I would not touch any of Stephenson’s books, until this year when finally an overwhelming number of recommendations accumulated. I relented and picked up “Anathem”, expecting confused and unfinished sentences, when instead I was hooked right from the start. “Anathem” is set on a world that is home to an ancient system and culture of secular monasteries, dedicated to science and philosophy, and carefully sealed from the rest of civilization. Most of the plot plays out in those monasteries, slowly revealing their weird culture, such as how even the monasteries are strictly separated into parts that open every ten years, every hundred years, and every thousand years, respectively. During the time the monastery is open, a significant and shocking discovery is made, the nature of which would be a spoiler if you haven’t read it, but it took me from appreciating the world Stephenson had built, and being curious about its many intricacies to being totally engrossed in the plot and longing for explanations, which Stephenson, through his characters’ philosophical discussions, does provide. I proceeded to read “Cryptonomicon” and “Seveneves”, but out of those three “Anathem” was by far the strongest book for me. This is a book about entrepreneurship and innovation, by Peter Thiel, one of PayPal’s founders. He puts out a lot of ideas, not all of which I agree with, but many of which I found good food for thought. In business, money is either an important thing or it is everything. Monopolists can afford to think about things other than making money. A monopoly is not necessarily a huge business. Most successful start-ups begin very small but they’re the only ones providing a particular service. In their domains, they are monopolies. Finance epitomizes indefinite thinking because it’s the only way to make money when you have no idea how to create it. But in an indefinite world, people actually prefer unlimited optionality; money is more valuable than anything you could possibly do with it. a definite person determines the one best thing to do and then does it. Instead of working tirelessly to make herself indistinguishable, she strives to be great at something substantive—to be a monopoly of one. This resonates with me, having had to waste time at school studying parochial subjects such as Austrian history and geography or Latin, when I would have been better off just doing math and English, and having the rest of my time for playing with computers. There’s plenty more to learn: we know more about the physics of faraway stars than we know about human nutrition. Bill Gates wrote a wonderful review of Randall Munroe’s “Thing Explainer”, a book that uses illustrations and only the one thousand most used English words to explain difficult concepts and products. The language is not just a gimmick. Avoiding difficult terminology makes Munroe reduce the inferential distance to his readers, making even difficult concepts easy to grasp. His explanation of turbofan jet engines—sky boat pushers—is much better than the one on the Wikipedia page. It’s where air goes in and out, food goes in, and words come out. Note: Some people don’t like it when you make words come out while you’re putting food in. If there are problems and everything is on fire, the special metal can get so hot that it starts moving like water. Sometimes, it can get hot enough to burn a hole through the floor. If that happens, this room is here so the watery metal can fall down and then spread out over the floor. It’s good if the metal can spread out, since when it’s all close together, it keeps making itself hotter. If this room ever gets used, it means everything has gone very, very wrong. I read the Kindle edition on my iPad, which worked very well, except that the page explaining operating rooms—rooms for helping people—was broken. I hope that’ll get fixed in an update soon. This book is a compilation of Eliezer Yudkowsky’s writings on the topics of rationality and artificial intelligence. It contains a lot of wisdom. As far as I know all of it can be found online, but the book provides a nice structure. I have highlighted and annotated more passages in this book than in any other by far. This is but a small selection. But ignorance exists in the map, not in the territory. If I am ignorant about a phenomenon, that is a fact about my own state of mind, not a fact about the phenomenon itself. A phenomenon can seem mysterious to some particular person. There are no phenomena which are mysterious of themselves. To worship a phenomenon because it seems so wonderfully mysterious is to worship your own ignorance. The ontological argument is just one weird application of this confusion, treating the map (your idea of God) like territory that just lacks existence. It’s as if the shape I drew into the Pacific Ocean part of my globe were a full-fledged continent whose only drawback was that it doesn’t exist. Quantum physics is not “weird.” You are weird. You have the absolutely bizarre idea that reality ought to consist of little billiard balls bopping around, when in fact reality is a perfectly normal cloud of complex amplitude in configuration space. This is your problem, not reality’s, and you are the one who needs to change. Your brain doesn’t treat words as logical definitions with no empirical consequences, and so neither should you. The mere act of creating a word can cause your mind to allocate a category, and thereby trigger unconscious inferences of similarity. Or block inferences of similarity; if I create two labels I can get your mind to allocate two categories. Once you can guess what your answer will be, you have probably already decided. If you can guess your answer half a second after hearing the question, then you have half a second in which to be intelligent. It’s not a lot of time. Some beliefs are very important to us, but yet we might be wrong. How can we even begin to evaluate those beliefs dispassionately? You would advise a religious person to try to visualize fully and deeply the world in which there is no God, and to, without excuses, come to the full understanding that if there is no God then they will be better off believing there is no God. If one cannot come to accept this on a deep emotional level, one will not be able to have a crisis of faith. So you should put in a sincere effort to visualize the alternative to your belief, the way that the best and highest skeptic would want you to visualize it. it is wisest to regard our past selves as fools beyond redemption— to see the people we once were as idiots entire. […] As long as we are making excuses for the past, trying to make it look better, respecting it, we cannot make a clean break. This obviously applies to non-religious beliefs, too. Politics is an extension of war by other means. Arguments are soldiers. Once you know which side you’re on, you must support all arguments of that side, and attack all arguments that appear to favor the enemy side; otherwise it’s like stabbing your soldiers in the back—providing aid and comfort to the enemy. If you defend yourself, you may have to kill. If you kill someone who could, in another world, have been your friend, that is a tragedy. And it is a tragedy. The other option, lying down and dying, is also a tragedy. Why must there be a non-tragic option? Who says that the best policy available must have no downside? Somewhat related to this is a post by Scott Alexander, whose blog you should definitely read. If people have the right to be tempted—and that’s what free will is all about—the market is going to respond by supplying as much temptation as can be sold. Paul Graham also wrote about this. Above all, don’t ask what to believe—ask what to anticipate. Every question of belief should flow from a question of anticipation, and that question of anticipation should be the center of the inquiry. As David Deutsch points out, this very idea, that only beliefs about physical observables are in any way relevant, is itself a belief that is not about physical observables, shooting itself in the foot. Rationality is not for winning debates, it is for deciding which side to join. Sometimes, all sides are wrong, and only a new idea will help, yet Bayesianism is very quiet on the topic of the generation of new hypotheses. Again, see David Deutsch for more arguments why science is not Bayesian. Walter Isaacson’s biography was badly received by the cognoscenti, so I didn’t bother reading it and can’t draw any comparison’s to Brent Schlender and Rick Tetzeli’s “Becoming Steve Jobs”, but I can definitely recommend the latter. This is not a collection of anecdotes about Jobs, although it does have its fair share. It’s the story of a person who learned and changed. The story starts with the visionary product creator who led the development of the Apple II and the Macintosh but failed to command the then much larger company Apple, ultimately being fired by the board. With NeXT he created yet another technological masterpiece but failed to bring the company to success, for a variety of reasons, while at the same time helping Pixar become what it is today. He emerged having learned from his failures, taking the helm at Apple again, but this time succeeding spectacularly, having become the Steve Jobs he’s remembered for now. On the car ride over to the prototype hangar, Johnson told Steve that he thought they’d gotten it all wrong. “Do you know how big a change this is,” Steve roared. “I don’t have time for this. I don’t want you to say a word to anyone about this. I don’t know what I think of this.” They sat for the rest of the short ride in silence. When they arrived at the hangar, Steve spoke to the assembled group: “Well,” he said, “Ron thinks we’ve designed our stores all wrong.” Johnson waited to hear where this line of thought would go. “And he’s right,” said Steve, “so I’m going to leave now and you should just do what he’s going to tell you to do.” And Jobs turned around and left. When playing around with a set implementation that Alexis Gallagher posted, I came across a problem with associated types: it exposes more type information than the user of a class needs, and worse, more than the user of a class should have. The reason being that Generator here is under-specified—it must be a Generator whose associated type Element is KeyType, but that can’t be specified. If Swift had generic type arguments for protocols, it would simply be Generator<KeyType>. The problem here is that the set type needs to publicly expose an implementation detail, namely the concrete type by which it implements its Generator. If that implementation detail changes, the method’s type changes, and code might break. The body of the function explains the weird GeneratorType: The dictionary has a keys property that is exactly what I need—a sequence of all the elements in the set. The type that I’m returning now is the generator type of that sequence, instead of my own, and I must specify the concrete return type. The only way to get the concrete type, however, is to look up the type that keys returns, which means that I now depend on an implementation detail of Dictionary, and, making matters worse, I’m surfacing it to my users. No leaked implementation details and no unneeded dependencies. In my last post on Swift I examined sequences and generators. Today we’ll implement our own sequence. There are three things we need here: The interpose function itself, which must return a Sequence, which, in turn, generates a Generator, which does the actual work of producing the items. InterposeGenerator is a little state machine that alternates between producing either an element of the original generator or the separator. A bit of care is required to make sure that it doesn’t produce the separator again after the generator is exhausted. As you can see, next is not marked as mutating, either. I suspect there are two things going on here: the protocol definition that Xcode shows is probably incorrect, in that the mutating modifier is missing. The definition that Swift actually uses contains the modifier. In addition, the compiler doesn’t know whether the Generator we are using to create InterposeGenerator is a value type or not, so it must assume that it is, for the sake of safety in the case of mutating functions. It seems to be a pattern in the base library for the Sequence and Generator to be implemented in the same type, which we could easily do here, as well. I’ll leave it as an exercise for the reader. I really like what we’ve seen so far of Swift, Apple’s new programming language. For starters, I was happy to learn that references cannot be nil, and integer arithmetic is checked by default. The equivalent of Sequence and Generator in C# are IEnumerable and IEnumerator. Let’s write a function that takes a sequence and returns an array containing all the sequence’s elements! 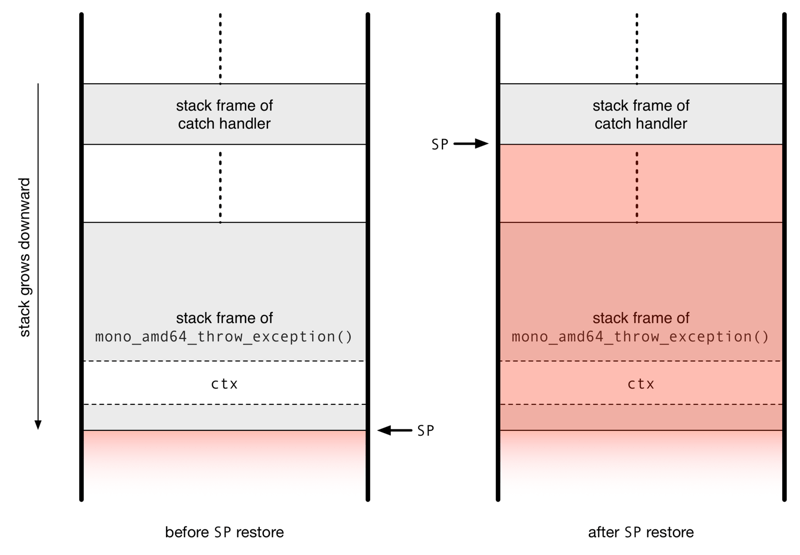 In my last blog post about SGen, Mono’s garbage collector, I wrote about concurrent mark-and-sweep, which makes most of the garbage collection work happen concurrently with the running program. One thing we cannot do in a concurrent collector, as opposed to a stop-the-world collector, is move objects around in memory. This is typically not a problem in a mark-and-sweep collector, but SGen goes beyond basic mark-and-sweep and prevents fragmentation by evacuating objects when the need arises. Fragmentation is no less of an issue in a concurrent collector, so being unable to do evacuation is problematic. Our best solution at this point is to stop the world when it happens. The threshold we use to decide when to do evacuation with concurrent mark-and-sweep is higher than on our non-concurrent collector, but there is still a chance that a full collection pause will hit the program when interactive speeds are desired. One possible use case would be a game, where you want the lowest latency possible while the player is in a level, but between levels, or during loads, a longer collection pause is not much of an issue. Note that there are still no guarantees about the lengths of the pauses—this is a best-effort approach, not a real-time garbage collector. This API will be available in the next Mono release, but only via reflection. It will be a public API on mobile soon. Like most garbage collectors, SGen is of the stop-the-world variety, which means that when the time has come to perform its work, it stops all managed threads in their tracks and only resumes them once it has finished. Nursery collections are usually relatively short affairs, and can be sped up even further by using a smaller nursery size. Major collections, on the other hand, can take a long time because they must scan every single live object in the system. Long garbage collection pauses are clearly a serious problem for many applications, be they interactive or on the server, and garbage collector engineers make considerable efforts to shorten pause times. One approach to this is to do parts of the major collection concurrently with the running program, aka the mutator. SGen’s major collector, mark-and-sweep, consists of two main phases, unsurprisingly called mark and sweep. Thanks to Zoltan’s recent work—lazy sweep—SGen already does most of sweep’s work outside of major collection pauses. I have been working on the other part of the story for the past few weeks: concurrent mark. Our implementation of concurrent mark is very similar to that of Sun JVM’s concurrent mark-and-sweep (CMS) collector. A major garbage collection starts with an initial marking pause, during which all roots are scanned. Then it restarts the world and in the background a worker thread performs the marking and scanning of major heap objects, in the usual manner. When the concurrent marking phase is done, the collector stops the world again to finish up the collection in the final marking pause. Let’s assume that right after a->next has been set in line 3, the concurrent worker thread scans and marks the node referenced by a, then follows next and processes c. If at that point our program hasn’t come around to setting c->next to b in line 5, the garbage collector will never encounter b—it will have been lost because for a brief moment that node wasn’t part of the list. We can recruit the help of our friend the write barrier to deal with this issue, but we need to extend its scope a little: instead of just recording stores that point from the major heap to the nursery, it must now also record stores pointing from the major heap to the major heap. In other words: all reference stores that happen in the major heap, no matter where they point to, must be recorded. With this new write barrier the store to c->next will record the node c as requiring a re-scan. This re-scanning of all modified major heap objects happens in the final marking pause, so it’s not further disturbed by the mutator. What if the final marking pause happens before c->next is set in line 5, however? The node b might not be pointed to by any object in the heap, so we won’t find it that way, yet it is still live. It’s live because it’s referenced by the variable b on the stack, so the final marking pause must also re-scan all roots. Nursery collections that happen while concurrent mark is running stop the world, but concurrent mark keeps chugging along. It never follows references into the nursery anyway, so there is little potential for conflict. There is an issue with the card table, however: nursery collections clear the card table, but its data is required during the final marking pause, which might only occur a few nursery collections later. The solution to this is to maintain a separate card table that accumulates the marked bits from the “regular” card table, and to use this union table in the final scan. 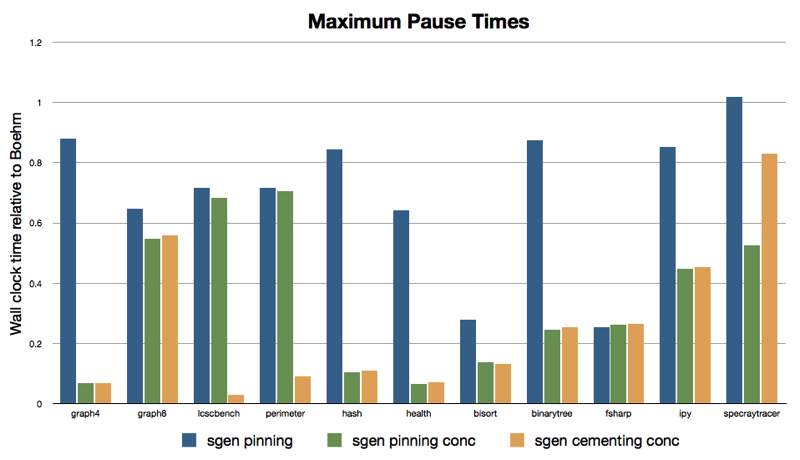 This graph shows maximum pause times for a few of the programs in our GC benchmarks suite. All of the pause times are relative to Boehm’s, so values below 1 are better than Boehm’s. Note that the values correspond to the longest stop-the-world pause that occurred when running the program, not the median or some average. The three SGen configurations are standard mark-and-sweep in blue, concurrent mark-and-sweep in green and concurrent mark-and-sweep in conjunction with cementing, in yellow. The programs represented in this graph are those whose maximum pause times with Boehm were longer than 10ms. The ones with the longest pause times are on the left—on graph4 Boehm had a pause of 2.5s—which are those that benefit most from concurrent mark, as expected: the longest pause on graph4 is less than 180ms with concurrent mark. I have not yet investigated why graph8 is such an outlier.